This lovely single story Green Valley home nestled in a park like setting offers serenity & privacy. Wonderful upgrades throughout include: beautiful master bd addition with stone fireplace, gorgeous bathroom, & Polk Audio ceiling speakers; attractive walnut engineered wood flooring; remodeled hall bath w/ barn door style glass shower enclosure; owned solar; bright kitchen w/2 skylights & granite counters; extra room off garage. So many wonderful touches make this home special! 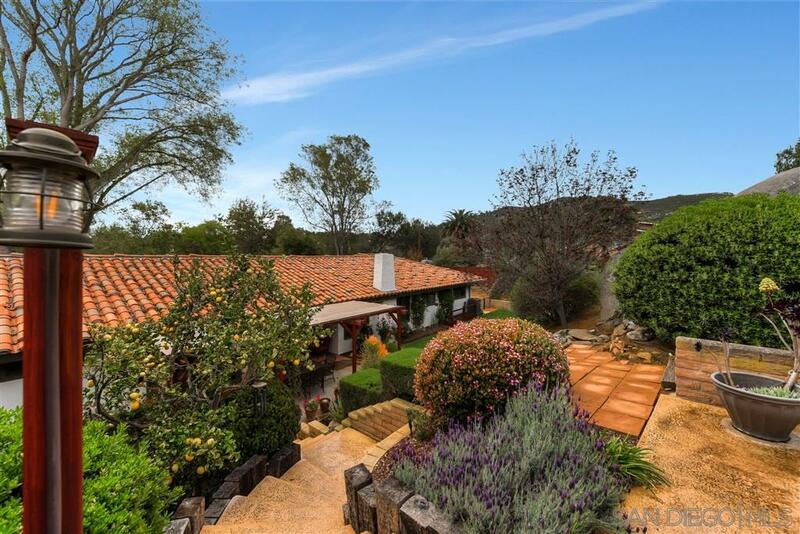 See supplement for more!, The beautiful backyard features numerous fruit trees, a natural rock waterfall, separate pool area on upper level with peaceful views, spa & firepit, a basketball court & spacious grass areas. Other features include: Ring doorbell; Nest thermostat; whole home wifi single SSID including pool area coverage; Charge Point electric vehicle wall charger; RV parking & hookups; whole home filtration system; replastered pool with new tile, Pentair Intellichlor Salt Water & Pentair Sun Touch Controller; pool solar heating system; all weather outdoor speakers in pool area; tankless water heater; solatubes. Located in the highly desirable Poway Unified School District. Special Financing Incentives available on this property from SIRVA Mortgage.